Why Blogging Is So Popular? Why You Should Start A Blog? So your here to find out what a blog is? Why Blogging is popular? And Why you should start a blog? I will tell you every question in this article. According to Wikipedia, a blog (a combination of web and log) is a personal journal published on the World-Wide-Web consisting of discrete entries typically displayed in reverse chronological order, so the most recent post appears first. Blogs are usually the work of a single individual, occasionally of a small group, and often are themed on a single subject. A blog can also be used as a verb, meaning to maintain or add content to a blog. So Why To Start Blogging & Why Blogging Is So Popular? 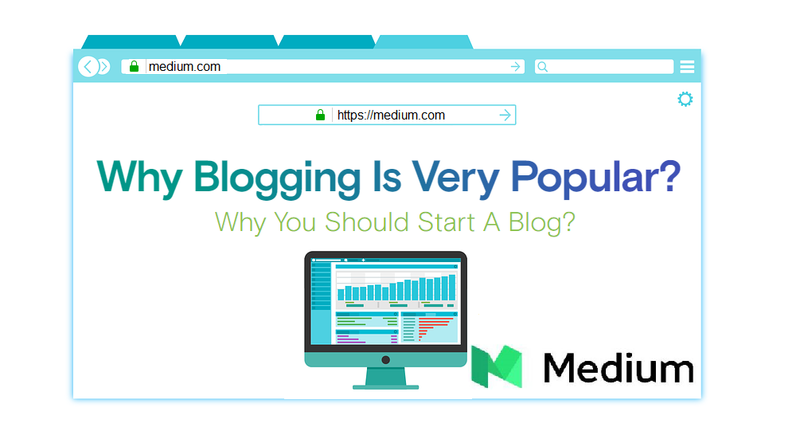 Blogging is growing more and more popular every day. There are thousands of blogger blogging on different niche or categories. People blog for various reasons. Some bloggers blog to share knowledge, some blog as a hobby and some blog to make some money online. There is no concrete reason why people blog. Here in this article, I will openly explain you to make the best decision about blogging. The below ten following points might help you in term of blogging success and why you should start blogging? Yes, it is true blogging is an excellent Search engine optimization tool for webmasters and business owners. Because Search engines like Google/Bing and Yahoo love’s new content, and as a result, blogging is recognized an excellent search engine optimization (SEO) tool for webmasters and business owners. So it is essential to have a blog section on the company website to bring traffic from the major search engines like Google. 2. To Express Thoughts and Opinions. A blog is also an excellent tool to express and share your thoughts, experiences, skills, pieces of knowledge, news and everything. Because in blog life your free to share ideas. 3: Blogging Is Best Way To Promote Products or Services. One of the cheapest forms of promoting services, products, and other things is blogging. So people choose blogs to promote their products or service. Blogging is a fabulous way to expand your store. With the right strategy, blogging can be an efficient way to drive visitors and promote your products. The HubSpot study showed that the more you blog, the more traffic comes to your website. As I told you, blogging is an excellent SEO tool, If you blog more, the search engines will love your content more and help you to bring massive traffic. Moreover, this massive traffic from search engines will convert into leads and sales to your new product or services. 4: Helping People By Sharing Your Knowledge & Experiences. You can help people in many ways while blogging. For example, you got a trip to America, Now if someone is interested in visiting America, he will be looking to find some experiences about America trip cost, places, and many more things. So writing about your trip on your blog can be helpful for someone else. You can help peoples by how to guides, stories, tips and tricks, strategy and techniques, trips and tons of more experiences while blogging. So blogging can be considered as the best tool for helping all over the world. 5: Blogging Can Help You To Introduce Yourself as an Expert. Blogging is a fantastic tool to help bloggers recognize themselves as experts in an online field or a particular topic. If you’re in search of a job or trying to build a career in a specific field, blogging can help legitimize your expertise and expand your online presence and platform. So it is another encouraging point for you to start blogging now. 6: Blogging Is The Way To Connect With Similar People. Another great benefit of blogging is, It helps to bring people of same thinking and opinion in a familiar place. When you start a blog, you can find people who want to share some advice, knowledge, feelings, and thoughts. 7: Blog Can Make Money. Blogs are becoming a more popular tool to generate money from online advertisement. Even though most bloggers don’t make a lot of money blogging, but there is significant potential. All you need is dedication, hard work, practice, and patience. Here are the most popular ways to make money online with blogging. Monetize your blog content with the advertisement. Media.net and Other PPC networks. Directing Ads selling with Adclerks, and Buysellads. Get paid for writing reviews about a specific product or service. Sell online courses and E-books. Accept donations on your blog. 8: Blogging Will Make You Better Writer. Every job/work includes writing emails, records, reports, and many more. Moreover, most jobs need a lot more writing skills mostly. Being able to write articulately, concisely, and correctly is essential and will go a long way in impressing your boss, friends, family, co-workers, experts and professional. Blogging will not push you to become a perfect writer; it will just happen as you do it regularly. So blogging can be the best way to make you perfect writer if you do regularly blog. 9: You will be an inspiration to others. In the era of blogging, There are many inspirations for us. Who teaches us from beginner level to advance level. Blogging is not only to make money or to become famous in the world. It is also an outstanding way to become an inspiration for someone by your knowledge, writing, and thoughts. 10: The Last Point, Blogging is Free or Affordable. You can start your new blog today without spending any cost. Blogging is totally free if you want to use it personally. However if you prefer it for professional use, you may cost hosting, domain, and design. My goal is to encourage towards blogging in order if you want to make your career in the internet marketing field. Blogging is easy, fun and money making tool for anyone. Blogging can be a hobby for many people. They take it as fun. People have a hobby to share knowledge through a blog.